This Wiki page contains permissively licensed WPS files for the Iriver H3x0 and iPod Color/Photo series of DAP's. For other models and instructions on how to upload a WPS see WpsGallery. 2. The theme uses patches or features not currently part of SVN. 1.request the author fix the theme via email, a forum post or PM etc. If you have fixed a theme, the updated version should be uploaded here (only, if the license is compatible, i.e. : CC-by-SA, GPL, etc.). Please honour the original author's intent and don't upload a "fix" which changes features or behavior. If you wish to modify a theme in this manner rerelease it under a new name. In case the theme you choose does not include the required font you should install the Rockbox font pack (install it the same way as a rockbox build). In D3, KITT "talks" during music playback, and stops talking on pause or FF & RW. This is my contribution to the large rockbox wps collection for the iriver H3xx targets. The concept I had in mind when creating this wps, was to make simple and plain graphics with some eye-catchy animations and to end up to a fully functional and easy to use interface. I hope the result does not deviate from all this. There are two versions of this wps. iCatcher uses the "nedore-9" font while Uni Catcher uses the "unifont" font. Updated iCatcher Themes, now working with any current build. Removed equalizer display support. Stripped some beyond the patchset features out of this theme I found somewhere and now it works on the Ipod Color. * DigiCurveAlpha_new.zip: Latest Syntax DigiCurveAlpha? * DGTV1.4_NEW.zip: Latest Syntax DGTV, 1.5 I guess ? This theme is inspired by the Rockbox logo. Originally created and tested on an iPod nano. I've modified it and tested for the iRiver H3x0 & iPod Color/Photo using the uisimulator software. This theme disables the default statusbar in both the WPS and "Files and Menu" screens. This is Cabbie 2.0 adapted for the default theme contest. This version sports a simplyfied version of the official logo. The alignment of the wps info is dependant on the use of album art (75x75). If no album art is found it aligns to the center. With album art the info text becomes left aligned. Rwps included. Based on Cabbie 2.0, this one has not much in common with the original Cabbie Theme (by Yohann Misquitta) anymore. It uses 75x75 album art. This theme was ported from the iPod Video version. 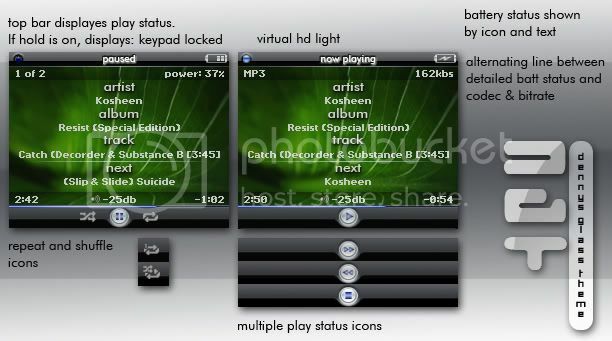 It was created with the goal of displaying as much control information as possible, also including some Rockbox powerful features, not so usually displayed in other themes, such as crossfade or replaygain modes. Each �widget� allows a quick visual setting�s control or information status check. Works on recent official builds. Better if using 75x75 Album Art bmp's. Enjoy! An original theme by me. Make sure you are using a current daily build (supporting viewports). The 75x75 album art has a nifty drop shadow (only present if an album art file is found). Text alignment changes to "center" when no album art is present. Inspired by jclix, this theme uses all original graphics and a wonderful background photo by Kristy. It uses 75x75 album art. Fully compatible with current builds. 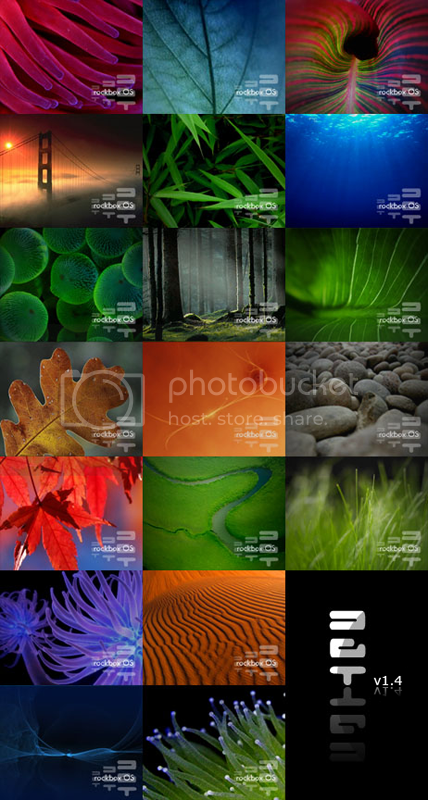 A new version of the Slick theme using a photo by Iuri Fernandes. As the name says, it's plain, it's simple, and I can't think of any more cliche synonyms. Album art is 128x128. This is a port of Saphrano's Free State theme for the Sansa e200. It works with any current build and features conditional viewports for AlbumArt ((75x75)px) display. I wanted a Theme that looks somehow nicer than just text, but with a lot of information. And good contrast. Just another theme. 75x75 album art. This work is licensed under a Creative Commons Attributio-Share Alike 3.0 Unported License. Ajant Unicode by pelinkovac, based on the Winamp theme D-Reliction by Linus Brolin. Touched up slightly and fixed for Rockbox 3.0 by myself. The Rockbox project is not responsible for the content of external links.